One of my favourite historic pieces of music television is the clip of Joy Division performing Transmission on BBC2’s Something Else back in 1979. The performance is bookended by an interview with the band’s then manager, Tony Wilson, alongside drummer Stephen Morris. In the clip, Wilson laments how the Manchester-based band’s track doesn’t have a universal appeal, due to it being “unsettling… slightly sinister and gothic”, despite its “hypnotic melody”. For many beer drinkers, modern beer – in particular the opaquely hazy and enticingly juicy IPAs that have shot to fame over the previous 24 months – may hold similarly unsettling qualities. Who knows what terrors may lie within a beer that will not drop bright? By rights, with enticing, accessible juicy fruit flavours and little to no bitterness, the modern hazy IPA has all the qualities that should hold universal appeal to all beer drinkers. But the nonconformity of the style gives it that unsettling character, because it doesn’t look like what we’re told beer is supposed to look like. New England IPA is the Joy Division of modern beer, and a keen sign that we’re in the post-punk – or dare I say the post-craft – beer era. 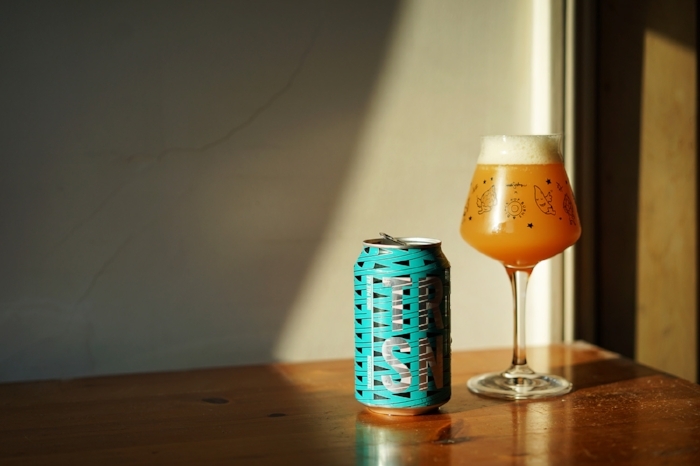 Transmission is also the name of a hazy IPA from Leeds based North Brewing Co. The brewery’s founders Christian Townsley and John Gyngell made their name in the Yorkshire city as the founders of North Bar, which is sometimes referred to as the first craft beer bar in the UK. North Bar has been a trendmaker and bastion within the Leeds scene since its founding in July 1997. Then, in 2015, Townsley and Gyngell decided to take the next step and launch their brewery under the same moniker. In recent months the brewery has really hit its stride and is producing some stellar beer. Transmission is an IPA that follows the modern trend of being hazy and juicy. Flavours of mango interweave between sheets of candy sugar, which are all tied together with a subtle dry and bitter snap in the finish, something that should satisfy even the most hardened of purists. Although its appearance and flavour may be unsettling and slightly sinister to those accustomed to the traditional, its accessibility will no doubt welcome an equally high volume of people to the genre. You can find more from beer writer Matthew Curtis as UK editor of Good Beer Hunting and on Twitter @totalcurtis. We love Transmission so much that it's now a core beer at HB&B. Pick up a can in store or online.